As winter draws closer, it becomes more and more difficult to maintain a healthy and radiant glow. The cold temperatures strip our skin of natural oils, and the shorter evenings limit our time spent in the sunshine (that’s if we’re lucky enough to get any!) However, there is no need to fret, as The Amazing Blog team has unearthed four new tanning related products: One to protect, one to give a sunless glow, another to enhance your existing tan and finally one to remove it all! All useful products but with very different missions. We particularly like to give ourselves a colour boost at this time of year, despite what the weather outside might suggest. The added bonus (and perhaps the most crucial factor) is that by using these products you gain a radiant glow without exposing the skin to harmful UV rays. Firstly, it’s easy to forget that our skin is exposed to harmful UVA and UVB rays on a daily basis. We came across HEVL’s SPF50 Face Creme a unique product that fights against both UVA and UVB rays, as well as the lesser-known danger of High Energy Visible Light. The beady eyed amongst you, will recognise that the brand name is a direct abbreviation of High Energy Visible Light (HEVL), and with this, comes a product that has been formulated by experts in the field of sun protection. For those of you who are unsure of what HEVL is, then you’re not alone. HEVL rays are produced in much the same way as UV rays, meaning they are damaging to the skin whether it is sunny or not. The most profound finding of our research, however, is that HEVL rays can cause a similar amount of damage as both UVA and UVB rays combined. 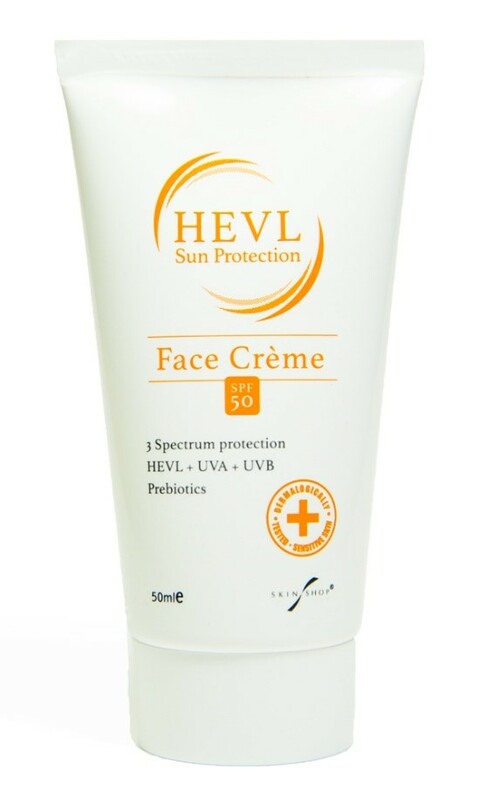 I’m sure you can understand why we were eager to try HEVL’s SPF50 Face Creme. This face cream has a multitude of benefits. It is SPF50, free from MI, SLS, parabens and perfumes, and suitable for even the most sensitive of skin; due to the light and non-greasy formula. We were also thrilled to discover that is has a slight skin-coloured tint, perfect for non-makeup wearing days, yet the formula acts as a smooth base for days when we require a little more coverage. The visible effects are apparent, however, the ingredients are the real talking point. The addition of Liposhield (a newly formulated ingredient that actively fights HEVL light) ensures that you can be safe in the knowledge that your skin is protected all day. Additionally, added prebiotics strengthen the skin, and maintain it’s natural barrier, aiding with the avails of dry winter skin. If you too would like to protect your skin this winter, then you can purchase a 50ml tube here for £19.95. Having protected our skin, the next step in our tanning routine is to use a self-tanning product. We were pleased to come across Curasano, a brand that promises to be inclusive of all skin types, providing effective products for an all year round bronze. This is something we admire, and having used their Spraytan Express for a multitude of special events, we can clarify that there was not a ‘carrot-look’ leg in sight! Initially based in Belgium, Curasano has been providing valuable cosmetics and health products since 2008, and are recommended by dermatologists across Europe. Curasano’s Spraytan Express is designed to activate the skin’s natural melanin from the inside, leaving you with an even and golden-brown glow. Self-tan lovers may be aware of the biscuit like smell that is often part and parcel of achieving a long-lasting colour; however Curasano defies this unpleasant side effect with the use of natural ingredients. These include ginseng, aloe vera and vitamin E, all of which are moisturising, yet gentle enough for those who have sensitive skin. We were surprised to find that it only comes in one shade, however, with a range of skin tones in the office, we can confirm that nobody was subject to a tangoed embarrassment. The spray is also suitable for the face, and even for those who suffer from psoriasis or acne. To achieve a party worthy glow, we used the Curasano Spraytan Sentz glove, a soft microfibre glove that helped us to cover our bodies evenly (even those hard to reach areas), and a fail-safe application tool for even the novices amongst us. To achieve an envious glow, apply an even layer over the desired areas, and you should be streak free and radiant for no less than 5 to 7 days. You need only use a small amount, and thus there are up to 60 treatments for the face, neck and décolleté, or up to 10 for the full body. To purchase a 200ml bottle of the Spraytan Express for £58.25, click here, and click here to purchase the corresponding Spraytan Sentz Glove for £7.41 . If at home tanning is still a scary prospect, then we may have the product for you. Solglo’s Tanning Mist is designed to add a bit of colour to natural skin, or can be used to extend your existing (professional or DIY) tan by between 5 and 7 days. The brainchild of United Beauty, an international group with an extensive portfolio of cosmetic and retail products, Solglo is award-winning in sunless spray-tanning products. United Beauty is a British manufactured brand, aiming to provide the ideal tanning solution for tanning professionals. We tried their Solglo Tanning Mist in Sun Kissed (which is the lightest), a spray tan in a can that helps to keep your tan looking fresh. The ingredients are effective at keeping the skin moisturised, with both vitamin E and aloe vera which help to ensure that your tan doesn’t flake. We were also pleased to find that the mist is non-greasy, leaving your skin feeling soft, without the sticky feeling of other leading brands. The mist is available in two shades, Sun Kissed (a lighter shade) and Sun Drenched (the darker shade), and both are vegan-friendly and cruelty-free. We were also encouraged to find that the brand is nut free. The added bonus for us was the coconut smell, taking away the stereotypically chemical smell of tanning products. Using this product left us feeling as though we’d been transported to a tropical island, a welcome daydream while cooped up in a central London office. To encourage your own exotic transportation, spray evenly across the skin, and enjoy the long-lasting colour. You’ll find that it dries quickly, and thankfully doesn’t transfer onto clothes or bedsheets. To purchase Solglo’s Tanning Mist for £15.58 see here. Finally, although this blog post suggests we’re all tanning experts…that is very far from the truth. We have witnessed many a ‘do I look orange’ moment in the office, and were therefore thankful to find CrazyAngel’s Strip Tease Tan Eraser. Crazy Angel is a brand that aims to offer personalised self-tanning, straying away from a ‘one colour fits all’ philosophy. The design of the packaging and branding is also unisex, fitting the company’s ethos of focusing on complementing skin tones rather than adhering to stereotypes. This is an outlook that we were impressed by, and one that compelled us to try their Strip Tease Tan Eraser. After previously trying Crazy Angel’s Midnight Delight Self-Tan Mousse (see here), we were eager to see how the Strip Tease Tan Eraser faired. We were suitably impressed (and relieved), to find a product that can solve our tanning woes without the use of harsh chemicals. The product is free from the use of alcohol, parabens and mineral oil and the formula itself has a delicate mousse texture, which aims to remove remnants of self-tan in just 5 minutes. Despite being a mousse, we were thankful that it didn’t leave our skin feeling tight; instead it had a silky smooth texture which left our skin feeling nourished (and ready for a new layer of tanning product). We recommend using this product to prep for any self-tan application, as it not only creates an excellent base, but also helps to ensure your bronzed glow lasts as long as possible. The Strip Tease Tan Eraser also has a pleasantly sweet and fruity scent, which draws away from the usually potent chemical smell of similar products. To purchase your own Strip Tease Tan Eraser for £14.99, click here. Self-tanning is often seen as a laborious and risky beauty ritual. Today we hope to have provided you with a few new tanning products to help make your routines a little less complicated and streak-free. All perfect for the forthcoming party season!